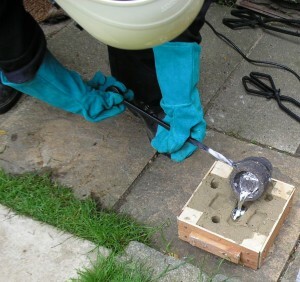 This morning the flower pot furnace was lit and I cast my first aluminium. 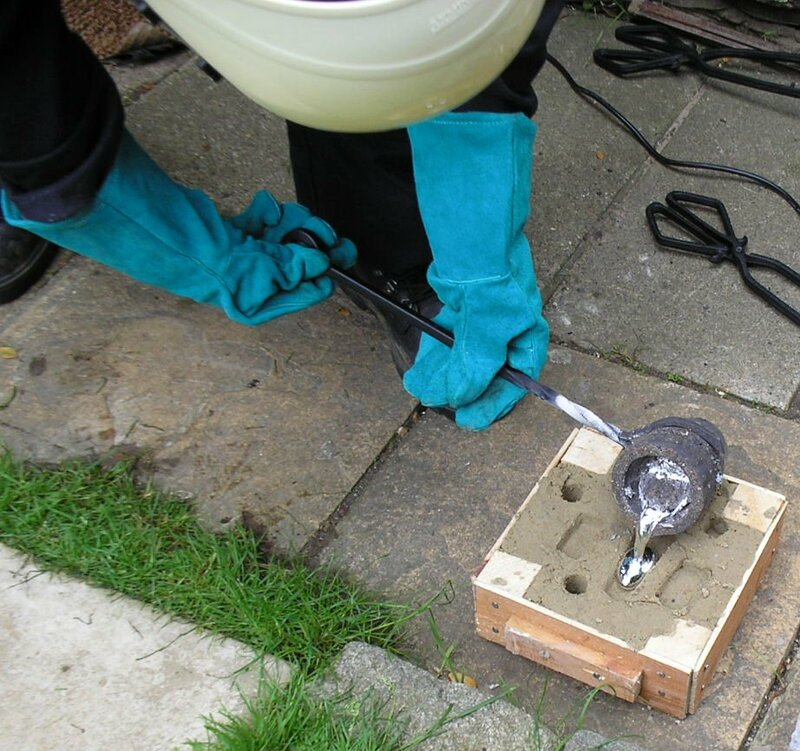 I’d finally got good weather, all the safety gear and tools were finished and I’d sawn up an old strip of aluminium into small chunks to fit into the crucible. Only the boots were of significant cost, the other items were source cheaply from several different suppliers. 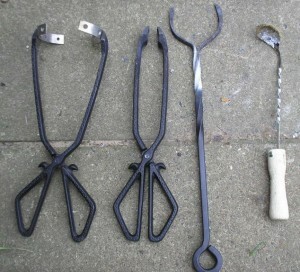 From left to right, crucible lifting tongs, regular tongs for coal and metal loading, pouring shank, skimming tool. 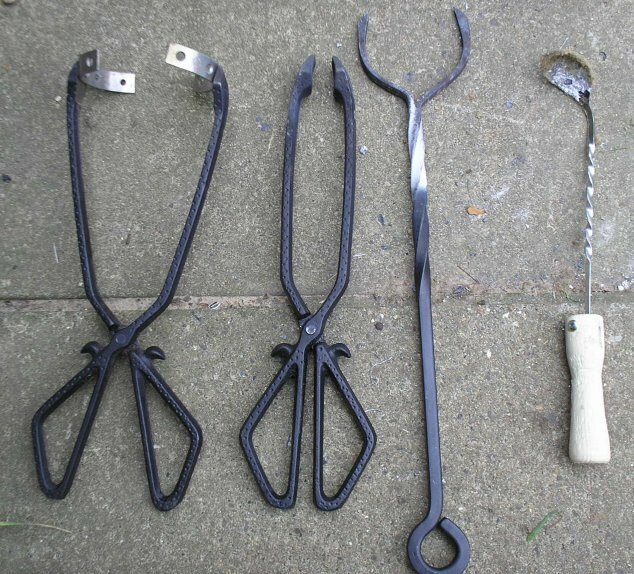 The lifting tongs were made from a pair of domestic coal tongs with the faces ground down and drilled so that bent pieces of “repair plate” could be pop riveted onto them. My workshop was black from the cast iron dust after that job! 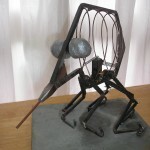 The pouring shank was made from a fire poker that was hacksawn down the end and then heated in the furnace till red and bent into shape with a large pair of pliers (not shown). The skimmer was a bend barman’s spoon with a hand turned wooden handle. 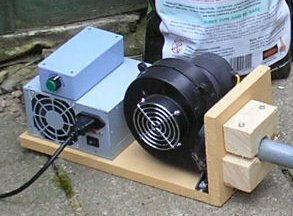 The blower was also an essential component, this was made from an old bilge pump taken out of my Dad’s Honeybee with a speed controller found on Ebay and a rewired PC Powersupply all mounted on a wooden frame with some metal tubing to connect it to the furnace. 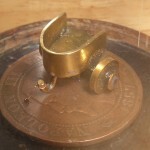 The molding flask was single part design made from some old wood offcuts and nails. The sand was made by mixing a “fullers earth” brand of cat litter with children’s play sand and a little water. It did stay in the flask and it did allow shapes to be made in it. However the detail of the initial patterns was lost as the sand stuck to the patterns (might have been a problem with the pattern being made from unvarnished clay). The latter pieces also spattered a bit when poured so my mix might have been too wet. I’ve quizzed the Home Foundry and Casting group to see if they know what was wrong. 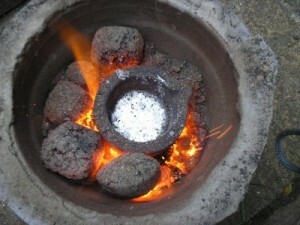 More fuel was added along with the crucible, the furnace was brought back up to temperature. 10 minutes later the first scrap was added, this was repeated over the next hour as it started to melt. I believe that I was misunderstanding what was happening at this point. 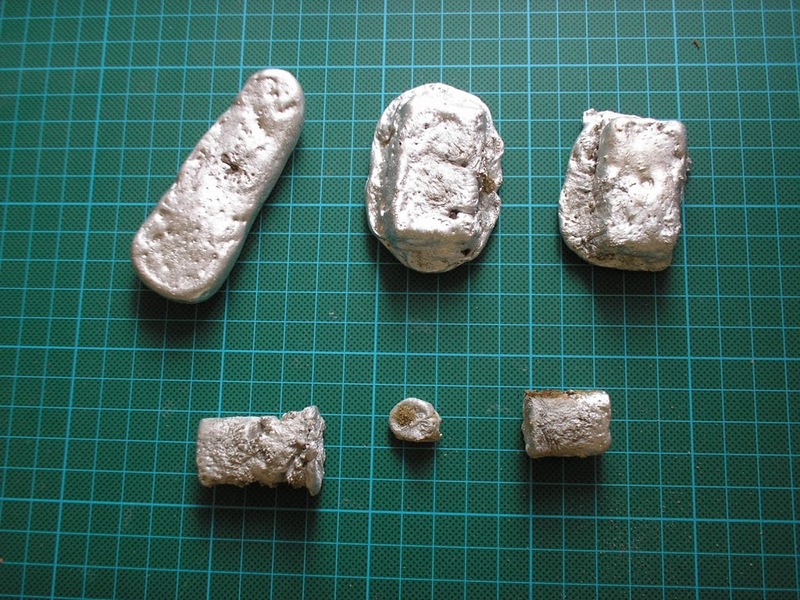 I think that there was a lot of crud in the mix which I thought was unmolten metal so it could have been skimmed and topped up more quickly than I was doing. We will have to see on the next melt to see if that is right. 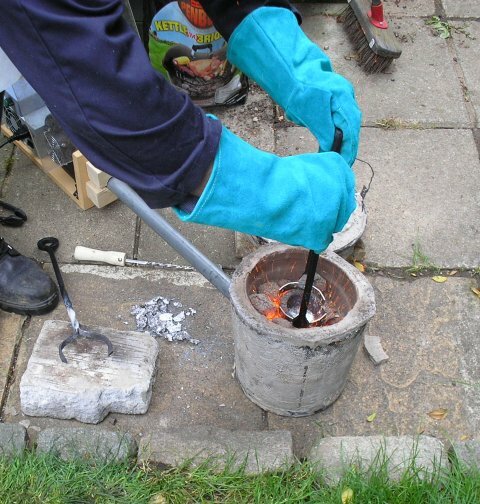 Eventually I had half a pot of molten aluminium and no scrap left. The first lift and pour went well but I was a little slow so the metal solidified in the spout of the crucible before I’d finished pouring. So back into the furnace and the next pour was a quicker. Here’s my raw results, the bottom items were very rough and one was slightly brown as the hole had been too close to the edge. However the larger blocks appear to have produced good results, I cut the side off of one and it appear to have no defects running through it. I’ll cut the other sides square later in the week to see if this is consistent. 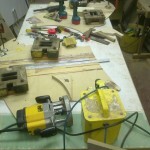 the top left piece when machined up will be a handle to hand crank the lathe for tapping and screw cutting. 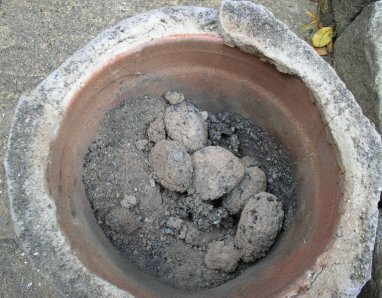 Because of the long time the furnace was running, approx 3 hours there was quite a lot of ash produced from the 2Kg of fuel burnt. 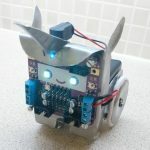 The next burn should use less fuel as I believe it is possible to get it up to temperature quicker and less time will be wasted waiting for the dross to melt when really it just needs removing. The furnace suffered a little damage with some of the top edge of mortar falling off and a crack developing in the flower pot. I’ve been informed that this latter issue is common and is unlikely to cause issues. I’ll try to give the new edge, more of a key when I repair it with fresh mortar. I’ve been advised that it’s possible that my sand is too damp. Looking at Backyard MetalCasting.com gives me an idea that my sand is not fine enough. Just wondering how you got the air into the flowerpot? Was it through the holes at the bottom or did you somehow cut a hole in the side? I would have thought the latter could weaken it. The hole is in the side of the furnace, see the article on making a flowerpot furnace for more details.